German IT distributor Bluechip hosted a webminar for its partners in which it shared a roadmap for the rest of 2018. Hoping to give its partners a heads-up on what to expect throughout the rest of the year, the 30 minute webinar inadvertently went public via YouTube, where VideoCardz managed to take some screenshots before the video was deleted. Interestingly the presentation included mentions and a sprinkling of details about AMD and Intel products that previously only existed in the shadows. AMD Z490 motherboards will emerge in June, likely tied in to the Computex show. AMD B450 boards will add new chipset features to the mainstream from late July. A second generation Threadripper (TR4, Colfax) and X399 motherboard refresh will launch sometime in August. The Z390 chipset is expected to happen well into Q3 2018, which seems to be rather late, well after Computex. 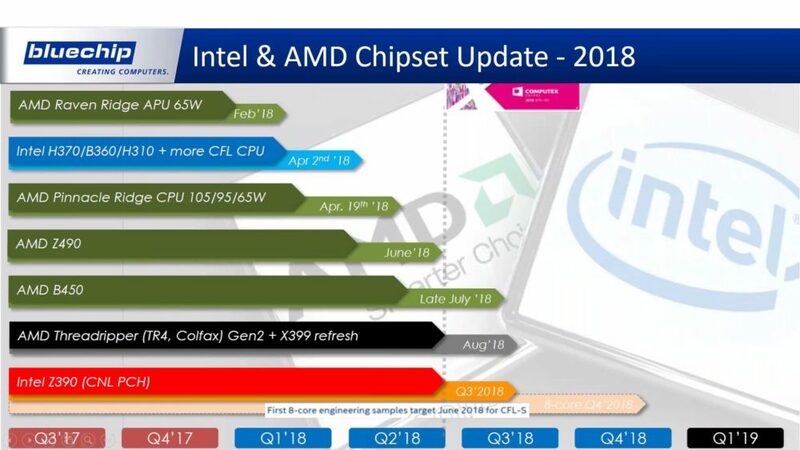 Also revealed by the Bluechip presentation was that Intel partners should expect to get their hands on 8-core Coffee Lake processor engineering samples sometime in June. Widespread availability isn’t expected until the motherboards arrive during the third quarter. I’ve just reproduced one overview slide, above, (and it’s a bit hard to read the Intel octa-core info thanks to the white text on light grey background) but there are more slides available at the source. I wonder what new chipset features would be added on the AMD side, they already seem pretty feature rich so would it just be more. 10GbE still seems stupidly expensive for something that is no faster than the USB ports that are now commonplace. We know AMD have the IP as it is in their ARM chips. That would make more sense if the chipset to CPU connection was PCIe 4.0, which in a closed CPU to chipset setting they could push for. At last a date set for B450 motherboards. I'm keen to pick up an ITX one with HDMI 2.0 for a new HTPC build.